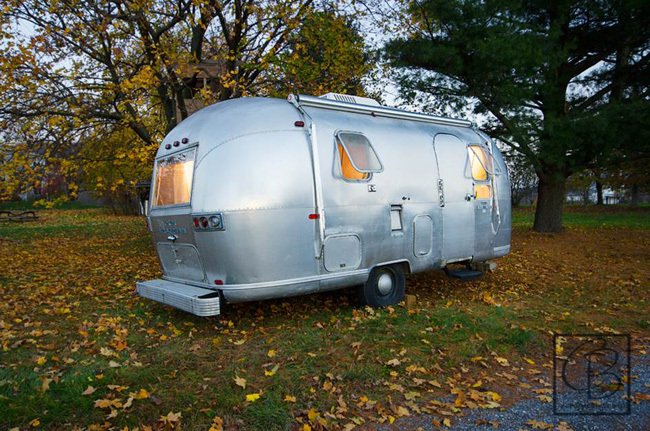 One day in a rural Vermont community, you may just come across a shiny silver Airstream trailer delivering a message of modern design. The trailer is a project of AIA Vermont, currently titled “Archistream: A Mobile Design Gallery and Education Center”, and was one of eight recipients of a national Innovation Fund grant by the American Institute of Architects. The grants ranged in size from $5,000 up to the largest, at $42,000, which was awarded to this project. A small group of dedicated architects plan to transform their new acquisition into a travelling design gallery and architecture studio. The plan is to travel the state with the refurbished trailer, showcasing the work of Vermont architects and advocating for local architecture and planning. The Airstream will house a gallery for AIA VT award winners and local architects, an education center with information about the profession, and space to host design charettes and children’s programs. Along the way, this iconic silver bullet will be spreading a message of sustainability, modernism, and innovation. TruexCullins designers Cam Featherstonehaugh, Josh Chafe, and Diantha Korzun all had a hand in this project, along with other members of AIA Vermont from around the state. The story of this Airstream project was recently featured on the Practicing Architecture page of the national AIA website. Kudos to the entire AIA VT team for such a creative endeavor! And we can’t wait to catch a glimpse of this Architecture Airstream on the roads of Vermont!